Sign Waiver Home Events & Clinics Swim First - Then Decide. Swim First - Then Decide. YOUR SCHEDULE, NOT OURS. WE SCHEDULE TO FIT YOUR NEEDS. WARM WATER POOLS & FACILITY. A FUN ENVIRONMENT FOR SWIMMERS. 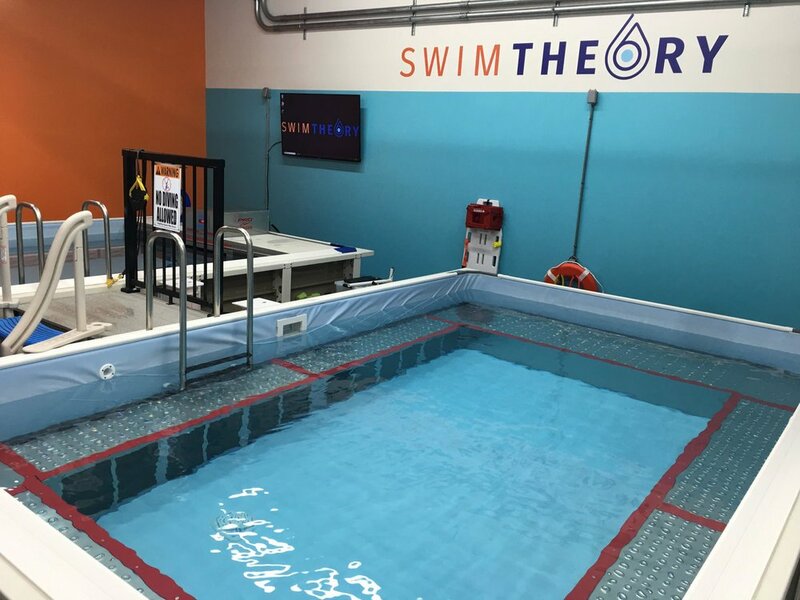 Swim Theory is the most advanced aquatic learning facility in the Saint Louis Metro Area. We offer small group classes, private lessons, and semi-private lessons. ALL AGES AND LEVELS ARE WELCOME (yes, that means adults). We teach proper swim technique, first building on freestyle and backstroke - the essential elements of water safety for kids and adults alike. For those students looking to learn proper 4 stroke technique, Swim Theory is the best investment of your time and money. Everything we do is backed by a satisfaction guarantee. Swim Theory uses a multi camera video system for live feedback and post session analysis to help competitive swimmers and triathletes SEE, FEEL, and UNDERSTAND changes to their stroke(s). "I will be spreading the good word about this place as it is about time someone recognizes the need for such a facility in the St. Louis area. We will definitely be returning!." "My daughter loved it. She cannot wait to go back." "Such a cool place! My daughter learned so much at her first lesson"
"Your facility is so much better than the other 3-4 places we have taken lessons. We Love it." "Hard to think that only a couple of sessions with you guys could make such a difference. Thank you guys." "Great place to get a good workout." "My daughter loves your facility. It is fun to learn in a smaller environment. She feels that the training is specifically targeted to her exact needs. Thanks again for such a great opportunity! We look forward to learning again with you soon." When coach Erin isn’t mentoring her team mates as the captain of a local university swim team, she brings her incredible pedigree to the pools of swim theory. her credentials as a scholar all American, ncaa championship qualifier, and record holder in the 500 free & 200 IM make her one of the most elite coaches in the STL METRO area. she hasn't met a swimmer she can’t teach. Swimming is not just a sport to dolo, it's a lifestyle and a discipline. dolo believes that swimming creates character, develops work ethic, trains the body mind & spirit. these beliefs are why dolo loves to teach swimming to others. dolo's swim career includes state and club accolades and a season as a diver as well. Theresa has been swimming for as long as she can remember. the work and dedication of her childhood passion culminated at the 2014 ymca age-group nationals where she achieved a qualifying standard time in the 100m breaststroke. Theresa swam with the saints at Maryville university and has served as an assistant coach for several swim clubs. Ellie is an accomplished competitive swimmer and works with swimmers of all ages. she’s especially successful teaching young learners to love water, feel safe, and appreciate swimming for all it’s value. Alex began swimming at age 8 for the boys and girls club. her passion for the sport culminated at Siuc, one of the top division I swim programs in the region. alex works with swimmers of all ages and abilities and loves to help people use swimming to overcome barriers and limitations in sports and life. Kelsey began swimming at early age and continued her competitive performance throughout high school. her passion is teaching and helping others, especially kids and older adults who may need a little extra attention and care during their instruction. Grant combines his passions for swimming and teaching to help others enrich their lives through achievement of personal aquatic goals. Grant is a former NCAA Division I swimmer with many collegiate accolades, school records, and championships. Here are some of his highlights. vanezza & tim realized the need for swim theory after experiencing the swim life through the eyes of their own three children. typical swim classes were too big, instructors were not well prepared, and the learning environment distracted the swimmers. Coach Grant with some of Swim Theory's first ever swim students. Visitors to our open house event lounging on the benches in the warm water of our Grey Pool. A view of both pools from our Grey Pool. This is where Swim Theory conducts all learn to swim classes. The perimeter benches provide a shallow walkway and seating area to make swimmers feel at home. Coach Grant providing in-session feedback while a student mimics corrected body position. Kids LOVE coming to Swim Theory. (Read our reviews). This young swimmer is sporting his Swim Theory T-Shirt and some cool shades from our open house.